Are Belly Buttons Inappropriate at Six Flags Over Georgia? To celebrate their third year wedding anniversary on June 1st, 2015, Gina and Michael Rivera decided to go to Six Flags Over Georgia by buying season passes and riding roller coasters. “We wanted to do kind of a Ferris Bueler’s Day Off kind of thing where we went around town and did a few things,” said Michael Rivera in a recent interview with Theme Park University. After purchasing their passes, they were told by a security guard at the front entrance that they would not be allowed entrance into the park unless Gina went into a store and bought a new shirt. According to the guard, Six Flags Over Georgia does not allow anyone to wear a shirt into the park where a belly button is visible. Gina was told that she had to purchase a new shirt with her own money. The above picture was the original shirt that Gina wore to the park that day which clearly shows her belly button. Michael and Gina were personally escorted into the park by the security guard who watched over them as Gina picked out a new shirt that met park guidelines at the Six Flags Marketplace gift shop. This new shirt featured completely open sides, which exposed her bra from the side and even some of her breasts that the shirt she originally wore into the park did not. The Six Flags Security Officer told them that they were now within park dress code guidelines, so they could go about their day. After riding a few roller coasters, Gina felt that this shirt was revealing a little too much. She decided to alleviate the problem by tying the shirt in the back, making it less loose so her bra wasn’t as exposed. Within minutes, Six Flags security approached them again saying that Gina wasn’t allowed to tie her shirt explaining it exposed her belly button, which was against park rules. Gina untied the shirt, but wasn’t happy with the decision. Furious, Michael and Gina went to Guest Services to file a complaint and to try and get the money back for the shirt they bought. While headed to the front of the park, Michael asked a third security guard where Guest Services was located and the guard asked what the issue was. After explaining the situation, the couple seemed to hit a brick wall. “That security guard told us that no matter how much complaining we did at Guest Services, we would not be getting back money or tickets from the park,” recalls Michael. After asking to speak to a manager within security, the couple was ultimately refused and was asked to leave the park. In total, 5 security guards escorted the couple out of the park. Once outside, they did speak with Guest Services but were told if they wanted any further assistance, they were to speak to Six Flags Corporate over the phone. Gina and Michael did speak with a Six Flags representative who candidly told them the park should have handled the situation differently. However, they needed to do an investigation internally first before they could give an official answer to potentially resolve the situation. Even more interesting is the change in the Six Flags Over Georgia website which seemed to happen overnight between June 1st and June 2nd. 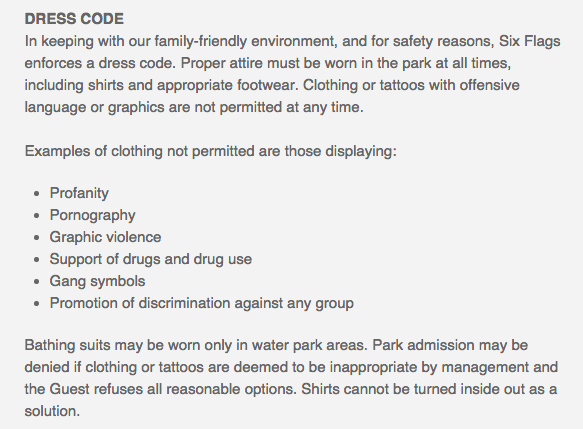 A friend of mine took a screen shot of the dress code policy at Six Flags Over Georgia on June 1st. Notice that while there is a guideline about inappropriate clothing, it doesn’t mention anything specifically about belly buttons being shown. A business is allowed to change their guest policy at any time as long as it fits within existing laws. Six Flags Over Georgia is within their legal guidelines to do this. However, isn’t a bit odd that the dress code changed just after the visit from the Rivera’s? Even more curious, as of June 2nd (the writing of this article) no other Six Flags park has the no belly button being exposed rule. Feel free to check out the park policies page for: Six Flags Great Adventure, Six Flags Magic Mountain, Six Flags St. Louis or Six Flags Great America. No other Six Flags park seems to openly advertise this policy, if it even exists at all. Which makes one wonder, what really happened here? Why does Six Flags Over Georgia care about belly buttons being exposed, but not bras or breasts? Did they just invent or just start enforcing a policy on the day of the Rivera’s visit and they were caught in the cross hairs? We may never know. What I do know is that Six Flags needs a clear and consistent policy that everyone can abide by, not by a few officials who can single someone out of a crowd. More importantly, is seeing an exposed belly button considered offensive or non-family friendly in 2015? 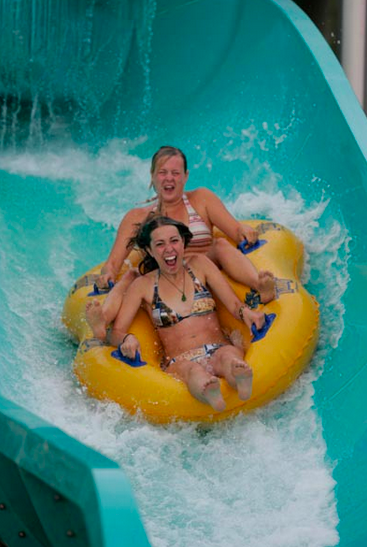 Especially in a theme park which contains water slides where thousands of them can be seen at any given time? Let me know your thoughts in the comment section below. 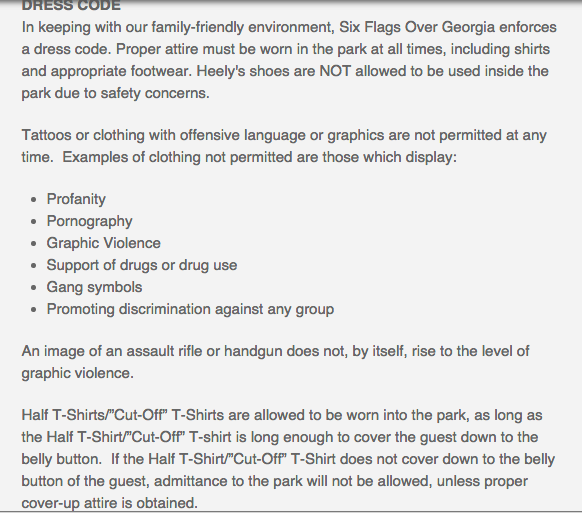 An image from Six Flags Over Georgia website – is this offensive? Make sure to follow Theme Park University on Twitter and like our Facebook Page! Doing any online shopping? Click on the Amazon links on this page and it helps TPU pay the bills and costs nothing extra! This entry was posted in Theme Parks 101 and tagged Belly Buttons, Dress Code, Park Policy, Six Flags Over Georgia. Bookmark the permalink. Trackbacks are closed, but you can post a comment. I had to check before sharing. I thought that I may have been reading an April 1 story! She couldn’t buy a shirt that covered everything. They might not offer refunds, but stores usually offer exchanges. As fan51 pointed out: a) Why did she pick that shirt the the side wide open? b) If she did pick that shirt, why not just wear it over the shirt she originally wore so that her navel was covered and it wouldn’t have been any hotter? 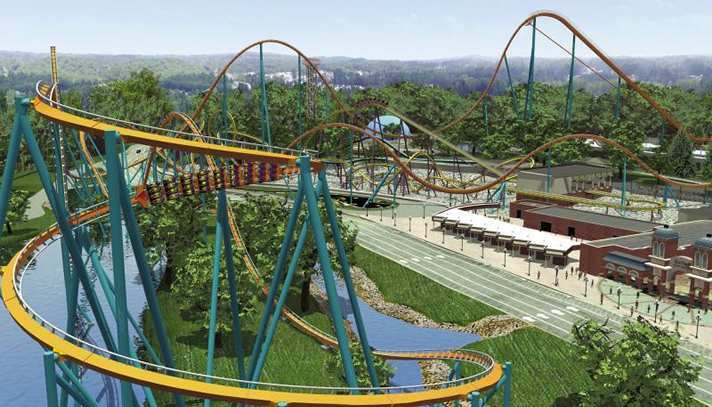 It’s almost like they were purposely trying to tweak Six Flags. Really, if you were just pulled to the side by security for your navel and told to go buy a shirt and you were just there to ride some coasters and have some fun, wouldn’t any normal person try to play it safe and get a normal T-shirt (or baby-T for the ladies)? You certainly wouldn’t go pick out one with the side open with the intent of swapping out your shirt (because, you’re supposedly trying to make security happy at this point). The only reason you’d do this is if you were purposely trying to set up an incident. It really doesn’t add up.